This special was built in the early 1950’s with its first competitive event being in 1952. The car started off as a full scale sketch on Ron’s father’s garage floor. The car consists of a space-frame chassis made from 2” cold drawn seamless tube, one under and one over the back axle. Like many specials of the time, Lancia Lambda suspension, brakes and rear axle are utilized. The front brakes though have been converted to hydraulic and the rear axle has a new crown-wheel and pinion fitted to suite the V8 engine fitted to the vehicle. A Ford side-valve V8 was the first power plant fitted driving through a Lancia gear-box. Ford engines of various states of tune were utilized over the next two years, the final being a stroked Mercury unit running on alcohol. Over Christmas of 1954 a 5.3 litre Oldsmobile overhead valve ‘Rocket’ series V8 motor was fitted along with a Jaguar close ratio gear-box. The engine was imported new from the USA and considered ‘The’ engine of the time. It preceded the small block Chev motor by several years and was of over-square design and incorporated many of the features of the small-block Chev engine. The engine was originally fitted with a 4-barrel carburetor and coil ignition and produced approximately 185hp@3800rpm. Fuel problems were experienced over the next couple race meetings and it was at this stage that new inlet manifolds and two twin-choke Holly carburetors were fitted. The coil ignition was also changed for a Scintilla Magneto. The car was built specifically for Hillclimb and sprint meetings, both these types of events being very popular in the 1950’s. It competed at Rob Roy and Templestowe in Melbourne, Hepburn Springs and Collingrove in South Australia, ascending these hills at close to the then current records. 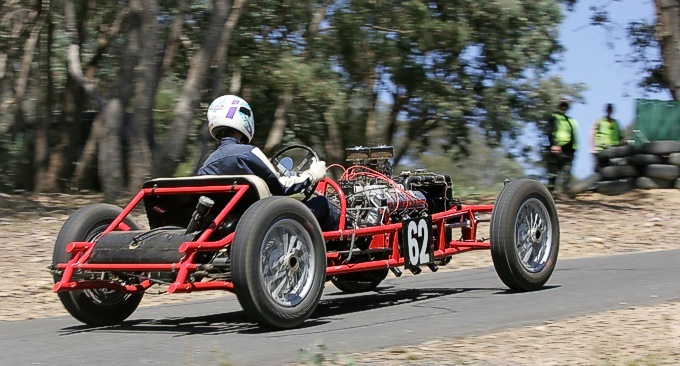 Redpath’s best year being 1955 when he came third in the Victorian Hillclimb Championship. The car is now raced by Ron’s son Bill, who spent a number of years restoring the car. Its first outing under Bill’s hands was the Geelong Speed Trials in 1996; 40 years after his Father competed at the first Speed Trials in 1956. Bill has since competed at Rob Roy, Tarrengower, Arthur’s Seat, Mangalore and Eddington sprints.